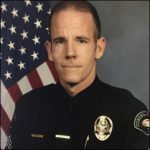 June 8, 2018 / Sergeant Ryan Brett / Comments Off on 2018 CALRO Conference is a WRAP! The annual California Association of Labor Relations Officer’s labor training was a great success this year. The conference was held at the amazing Omni Rancho Las Palmas Hotel in Rancho Mirage, California. 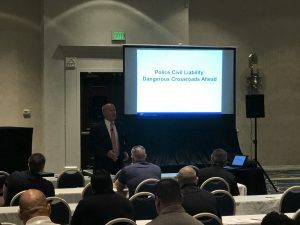 Attendees received two days of training in labor disputes and protected speech type demonstrations, solicitors, and other case law specific issues relating to demonstrative activity. The training was provided by Lt. Shawn Freeman of the Redondo Beach Police Department and was well received. The second day was a special day with an appearance from Attorney Scott MacLatchie, a North Carolina based attorney specializing in police liability. Scott’s training was focused on First Amendment audits and the recording of police. Best practice and common sense issues were discussed and many videos were shown brining to light recent shortcomings in police training resulting in liability for police. Between sessions, attendees were provided breakfast and lunch, with a generous hospitality suite. A great time was had by all and we at CALRO wish to thank all the agencies and attendees for their participation contributing to the success of the program. 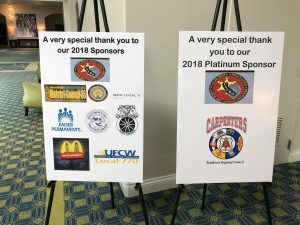 We also extend a tremendous thank you to our sponsors, including the platinum sponsor, the Southwest Carpenter’s Union. The Carpenters contribute to the CALRO cause annually and promote relationships between business, labor, and law enforcement with their actions. We hope to see everyone next year again for the 2019 annual conference. I am sure we will have a lot to discuss!